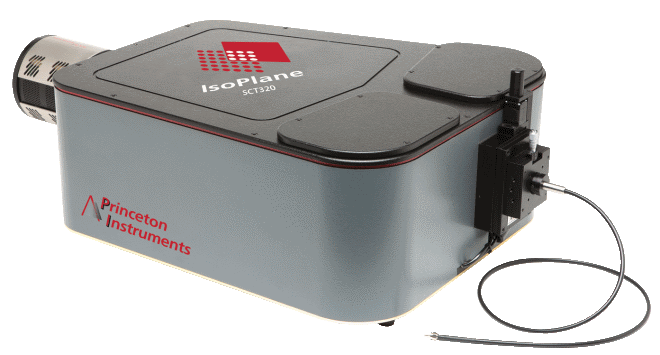 May 8, 2012 – San Jose, CA – The newest imaging spectrograph from Princeton Instruments, the IsoPlane SCT-320, will be unveiled at the Spring 2012 CLEO show in San Jose on Tuesday, May 8. The IsoPlane™ (patent pending) features a revolutionary new optical design that eliminates the primary aberrations present in traditional imaging spectrographs. It produces images that are clearer and sharper across the focal plane than any comparable spectrograph on the market. As a result, more photons end up in spectral peaks, significantly increasing the effective signal-to-noise ratio (SNR). Czerny-Turner imaging spectrographs are subject to imaging aberrations such as coma, astigmatism, and spherical aberration. Coma limits the spectral resolution of a spectrograph at most wavelengths, as it can be eliminated at only a single grating angle. The IsoPlane SCT-320 greatly reduces coma, thus preserving spectral resolution at all wavelengths. Astigmatism appears as a vertical distortion of an image, limiting both spectral and spatial resolution. Astigmatism is completely eliminated in the IsoPlane SCT-320 spectrograph. This means that many more fibers in a bundle can be resolved, eliminating crosstalk in multichannel spectroscopy. Applications for the IsoPlane spectrograph include multichannel spectroscopy, microspectroscopy, Raman scattering, fluorescence, photoluminescence, laser-induced breakdown spectroscopy (LIBS), Fourier-domain spectroscopy, biomedical imaging, and most other spectroscopic imaging techniques.